The Sloggi Start Hipster is great value twin pack.This striking range of underwear features a unique design as there is no back seam: creating the ultimate in comfort.These twin packs are available in a selection of mixed colours to ensure fantastic choice and value for money. 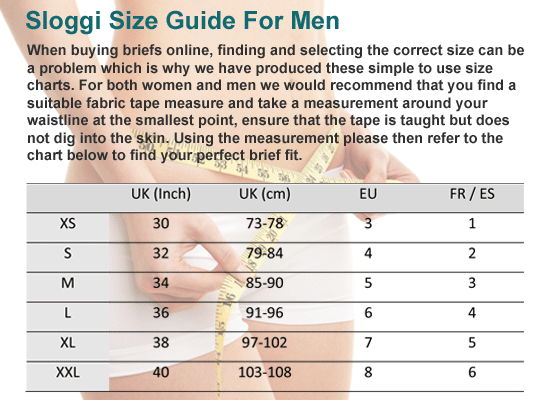 Men's Sloggi underwear is by far the best quality and most comfortable I have ever used. I have purchased designer label and M&S in the past and nothing, but nothing comes anywhere near Sloggi's for comfort and value for money. Love sloggis and these were very good. Lovely fit and very comfortable. these would have to be the best jocks I have ever worn. Absolutely great for me as I do a lot of quick walking - no rubbing or chaffing and are light and can be wash out easily. Great product from a company that provides great service.